Sorry to keep you all waiting lovely people! Here are the pics from Saturday’s Lego Party to celebrate Bear’s 6th birthday! I made the sign by downloading the free lego font and printing it out, sticking it onto yellow card, cutting it out and then sticking it on to red card. Lego bunting was made from coloured card and the dots were made by using a large circle punch stuck on with padded double sided tape. The water bottles were decorated using the same method. Marshmallow Lego heads - I died the marshmallows yellow using this method and then drew the faces on with an edible ink pen. You can vaguely see in the background the chocolate grissini sticks – simple tutorial here. Of course, as per usual, I started taking photos after everyone had already begun to attack the food … you can see what was popular first – the marshmallow heads, the jellies and the blue, yellow & red biscuits! 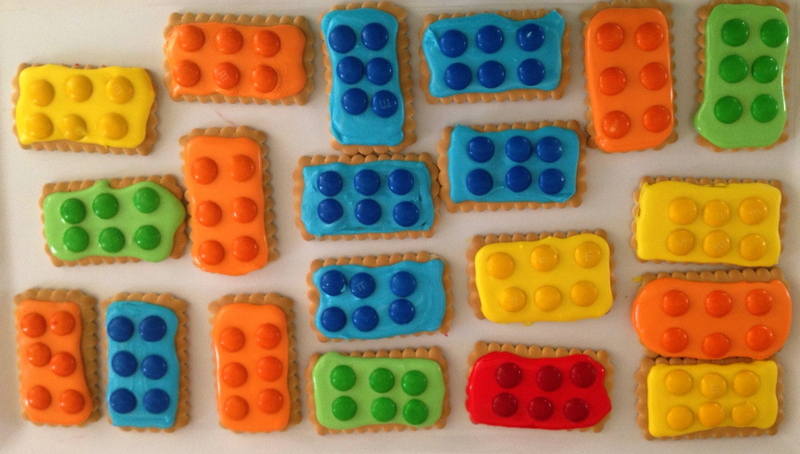 Lego Brick Birthday Cake – totally thought that I was taking the easy way out here by making lego bricks, but those oreo cookies were quite painful to ice with butter icing! Don’t even ask how much red food dye (I even used the gel stuff) was in the red lego brick! Did not cut that one up at the party! Note to self: avoid party themes that require a red cake! Click on the cake for more Frog, Goose & Bear parties! * No, that sharp knife is not pointed at my four month old niece!